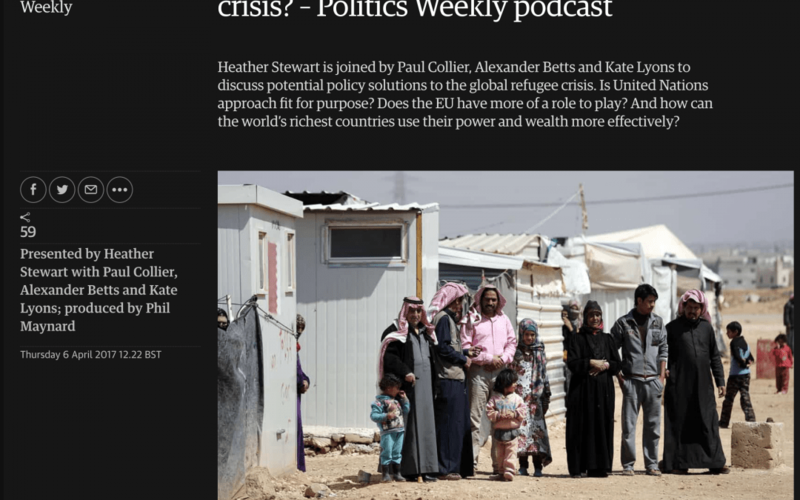 Can politicians solve the refugee crisis? This is a brief summary of the discussion and highlights an economic model that allows refugees to work, to contribute, have freedom of movement which will support them to build towards their own future in their home country on their return. Most refugees want to go home, most stay in the regional havens close to Syria. Half the population of Syria is displaced in Jordan, Turkey and Lebanon. We spend £100 for every refugee in Europe and spend less than £1 on those in a safe haven. Our duty of rescue should be something that restores normality and which gives dignity of work and autonomy.Now we offer free food, free shelter in camps in old fashioned model used for the las 50 years. Refugees want to work and have freedom of movement. They also don’t go to the camps, but tend to go to cities to find work and the tragedy is that is illegal. Camps tend to be the default we use as a means of support as an emergency phase but they then can endure for decades. We need new models with basic socio economic rights which benefit host country and refugees.Uganda has a self reliance strategy where refugees contribute. They work in Kampala and are given land. Many run businesses which employ others citizens. Refuges should have economic freedoms, refugees are not migrants, they want to go home. The solution in Jordan was to get European business to bring jobs to the industrial zone to be shared between citizens and refugees and make a viable system. This encouraged world business to take jobs to Jordan. This model has been successful and is now applied in Africa, Ethiopia. The worry maybe that this system makes people permanent in the host country? People are not able to go home but also if we empower people with jobs and freedoms they will be in a better position to go home and contribute when they return, it makes return more possible. Helping people to have autonomy while in exile means they can contribute back on returning home and reconstruct. The explanation by UK is that it does not want to create a pull factor for refugees to make journey to UK and so it does not give the right to work. Dudds scheme did not want to give incentive to traffikers to bring children. We have to have a system that does not encourage unaccompanied children to be sent in the first place. Let’s focus on things that work for the millions, the large scale rather than the smaller numbers who will be helped by a bigger solution. The system needs fixing it is out of date. Europe and UK appear to be unable to tackle the problem in a rational way. The global system and 1951 convention created in aftermath of the 2nd World War and the refugee convention defines refugees as fleeing persecution. It is outdated , most people are not fleeing governments but fragile states. There is great inconsistency. UNHCR good at giving legal support and care and maintenance but not with the vision of a future and of economic analysis. The Dublin system which allocates responsibility to the front line states has failed and is designed for small numbers. Refugees want jobs. Go to the World Bank to change policy to offer loan to create jobs for refugees and education economic development problem rather than humanitarian problem. Needs to be about business and generating jobs.